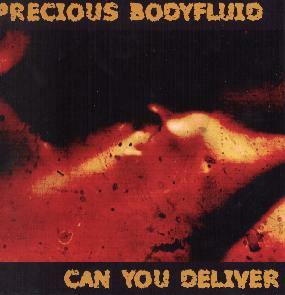 Precious Bodyfluid - Can You Deliver"
Precious Bodyfluid - "Can You Deliver"
Precious Bodyfluid is a band that has been around for some years now playing on the local Copenhagen scene. The band features On Trial vocalist Bo on lead vocals and guitar as well as Kjeld on drums (Ex-Gas Giant), and Niels on guitar and Peter on bass. The band has produced this 3 song EP. It was recorded in December 2002 and mixed throughout 2003. The CD begins with the hard drivin’ and melodic Tzunami. Bo is a fantastic and unique singer and this music has the same drive as On Trial but is not psychedelic in nature at all and more melodic hard rock with strong playing. Can You Deliver is a mood rocker and the guitar line reminds me a bit of Neil Young. For All I Know brings it down and is an acoustic ballad that freaks out a bit in the middle and if it stayed in that dark place could be an On Trial song. A great demo CD. I look forward to hearing more for this band! For more information you can visit the Precious Bodyfluid web site at: http://www.precious.dk.